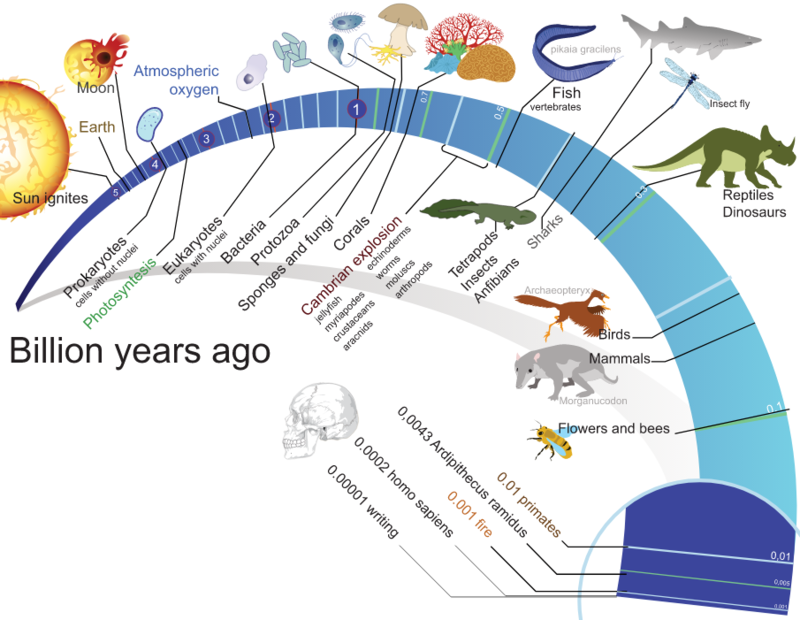 Why the Deep Dive into Evolutionary History? The history of life is our greatest teacher. One of the things that sets my work on culture design apart from other frameworks for guiding social change is the emphasis on translating the best scientific knowledge and tools available for use by change practitioners. An implication of this approach is that science itself has something valuable to offer as humanity grapples with its current global predicament. As many of you know, I have meandered across many bodies of knowledge in my life — most notably the mathematical study of complexity, foundational training in the physical sciences, the history and philosophy of science, the cognitive and behavioral sciences, and my recent deep dive into cultural evolutionary studies. You might wonder what drives a person like me to be so curious about such a dizzying array of topics. At the heart of it all is something that moves me personally in a way that could be described as spiritual. I find deep beauty in the ability to see patterns that are real in the world. Nature is my great inspiration. And this is made profound by the simple observation that I am part of nature and so my experience of reverence is an expression of nature knowing and loving itself. Thus I am moved by the beauty and inherent intelligence of our Universe. What seems to require more explanation is why I am now spending so much time reading books about the history of evolutionary sciences. In the last two years, I have read more than 40 books on this subject alone. When the world we all know and love is so violently and urgently threatened, it may be a mystery why so much time would be dedicated to rediscovering what people thought about the patterns of biology decades (even centuries) ago. What I am learning is that by seeing how the false starts, blind spots, transformative research tools, and foundational discoveries that made the complexity of biology accessible to scientific inquiry are replicated in the struggles to make sense of the human relationship to our natural world today. For example, the study of biological evolution was hindered for 50 years by one major controversy — whether new species emerge whole cloth as a single major mutation occurs or if they emerge gradually over time through the accumulation of small changes. Note the parallel to the deep controversies about whether humanity should continue with an incremental approach to social change versus a “transformation” or paradigm shift to a whole new system for organizing social life. This debate has created entrenched tribal differences among those who share acknowledgements about the basic nature of the global crisis. Yet mired in argument they remain. Similarly, there is the question about mechanisms. What were the direct cause-effect relationships between changing environments and the emergence of new kinds of biological organisms? How might this be reflected in the questions about new kinds of cultural expressions (policies, social norms and practices, institutional structures, technologies, etc.) that keep so many change makers awake at night? Which is to say that there are insights about how the scientists managed to etch away at their disagreements to build up a body of knowledge that is fully vetted and broadly understood. The same cannot yet be said about the cultural evolution of human communities toward health and resilience in the 21st Century. If anything, all evidence points to our glaring ignorance about how environmental changes impact our daily lives. This knowledge is sorely needed! So I shall take more time over the holidays unpacking the history of evolutionary science — weening lessons and insights that can be translated into the realm of social change practice. I look forward to learning together more actively with all of you in the new year.